As with many things in life, when you have your established paths and businesses that you frequent, it’s easy for the rest to pass you by in the blur of your peripheral vision while you go about your routine. Tamis Café, a café/Filipino restaurant, sits just steps away from the corner of Bank and Fourth, but until recently I was completely unaware of it despite coming and going by there countless times in the past year. It was only when doing some research on the international restaurant options in the city that it popped up on my radar. Last year while taking a pre-holidays break with my wife, we decided to try out Tamis on our way to a movie at Lansdowne. Arriving just after 11am, the place was pretty quiet in the pre-lunch lull, but the small, brick- and wood-adorned space never felt empty. I had scoped out their menu beforehand on their lovely website, and then consulted a Filipino friend on what to get, so ordering went quickly, going with the lumpia ($7.90), pancit ($12.75) and grilled chicken adobo ($14). Everything seemed to be cooked to order, but didn’t take an unreasonable amount of time to arrive at our table. 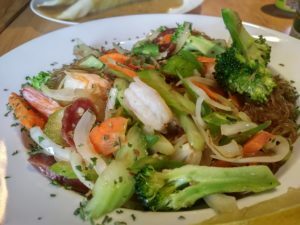 The pancit was a stir fry of thin rice or sweet potato noodles with assorted veggies, Chinese sausage, and shrimp. Unfortunately, the shrimp in it wasn’t mentioned on the menu, so my allergic wife had to forego this dish. The veggies were all a nice tender-crisp texture, with a vibrant colour that spoke to their freshness and the skill of the cook. It’s a rare noodle that I don’t enjoy at least a little bit, but I really liked the soft texture of the pancit noodles. For some they might be a little too slippery, especially if you have a thing about texture, but they fed my love of elongated carbs nicely. The Chinese sausage added pleasant pops of flavour, although the shrimp was a bit dry and bland. 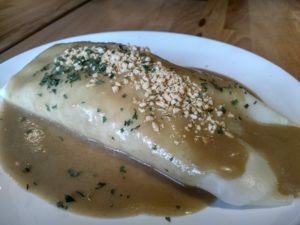 The lumpia – a vegetable crepe – was loaded with tender sweet potato, carrots, onions and other reasonably-healthy items, but the star of the dish was certainly the peanut sauce. It had a strong peanut flavour, but wasn’t sweet like peanut butter, and a crumble of peanuts added some crunch to a dish that was a pleasant mix of textures. Last but not least was the unofficial national dish of the Philippines, chicken adobo. The variations of recipes for it vary from family to family, but the base of the adobo is typically vinegar, soy sauce, garlic and pepper. It came plated a bit differently than I had expected, with slices of breast that were individually sauced and grilled, instead of the drum sticks and thighs I was anticipating. It makes for cleaner, quicker eating, but I prefer those other cuts for their superior flavour and juiciness compared to breast meat. 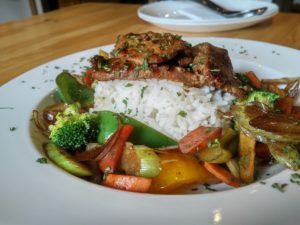 While it had a pleasant tanginess with a deep flavour profile, the thin cuts of breast meat were a bit on the dry side of the moisture spectrum. The dish as a whole was sizeable, but if you’re looking for protein, you’ll probably want to go for the grilled pork chop, which at just $0.75 more is a steal compared to the somewhat meagre portion here. Staff were helpful, and really friendly, exemplifying the best of a family-run business. Alas, we didn’t have the time or stomach space to sample any of their baked goods or coffee. 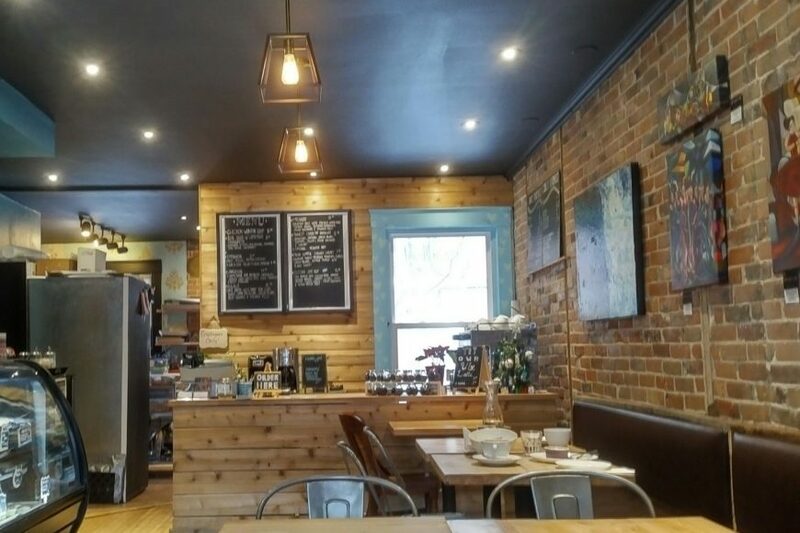 While a lot of mom-and-pop restaurants are now often on the fringes of cities where rent is cheaper, it’s encouraging to see Tamis Café making a go of things in the heart of the Glebe, pumping out some caffeinated beverages and solid Filipino dishes for the masses.